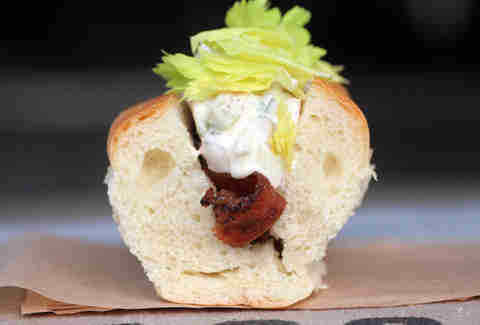 Top Chef Masters vet David Burke has opened possibly the most ‘Merican sandwich shop imaginable: a bacon bar, a place where pork belly lovers -- nay, freedom fighters -- are presented with a menu of slider-sized options (and sweets!) that really just boil down to one choice: liberty. We’ve taken the liberty (!) 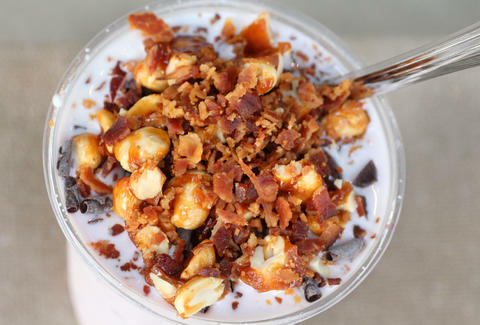 of grabbing every bacon-ated item available such as the vanilla flurry with whiskey-soaked cherries, chocolate shavings, chocolate sauce, and a bacon brittle topping. 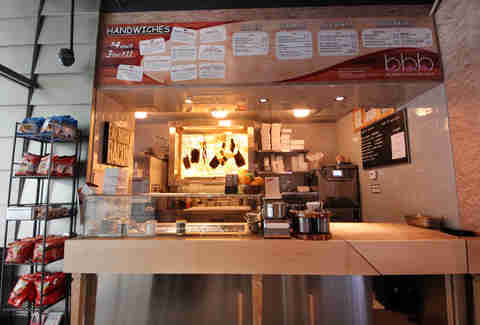 Located in the James Hotel, the small grab-and-go counter offers a variety of handwiches (hand-sized sandwiches), with three of them being the equivalent of a sub. 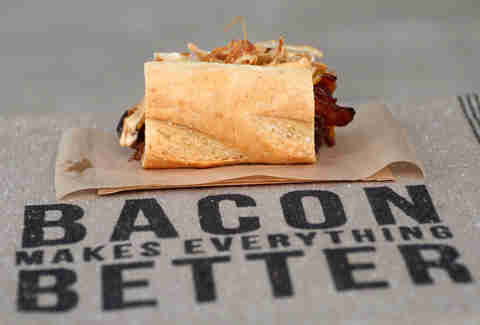 You’ll also be able to get your bacon fix by delivery seven days a week: 11a-10p Mon-Sat, 11a-9p Sundays. 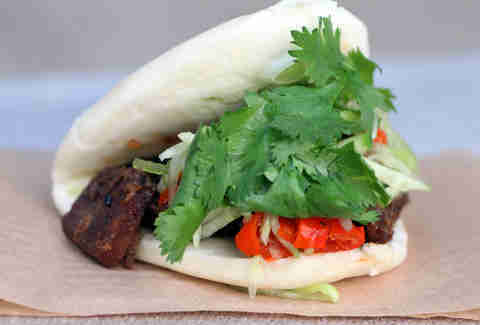 Leading off the sandwich list is this five-spice dry-aged duck bun with Chinese bacon, hoisin sauce, cucumber & cilantro. 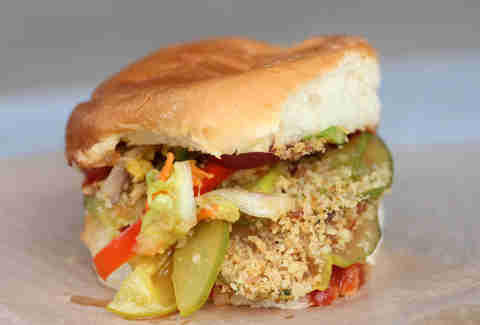 You’ll want to pick up an extra Big Kahuna Spamwich (BBQ’d Spam, pineapple slaw, bacon crumbs, pickles) for Jules, just in case he wants to break in and give you the whole Ezekiel 25:17-execution routine. 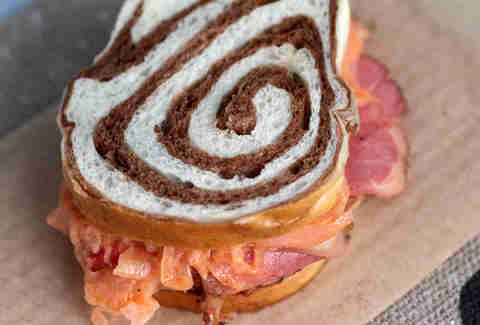 The Angry Reuben is more fired up than Rick Rubin on a bad beard day, because it has bacon kraut soaked in ghost pepper vodka along with Smoking Goose beef pastrami, Swiss, and marbled rye. This simple-seeming turkey wrap is more than meets (meats?) 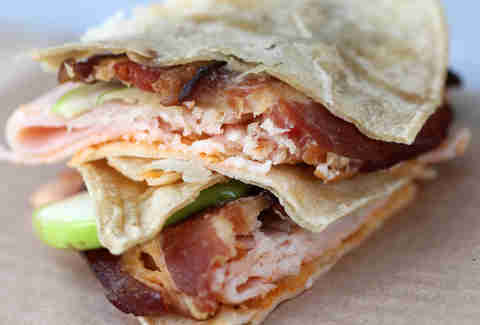 the eye -- a corn tortilla packed with tomato fondue, lemon aioli, apples, and Benton's bacon, hickory-smoked in Tennessee. Burke’s take on a seafood roll, the Chilly Willy has creamy shrimp salad, black pepper bacon, and lemon. And no penguin. There can’t possibly be more bacon on this menu, right? How WRONG you are, disembodied straw man. 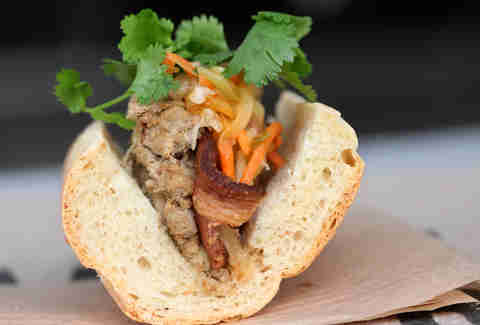 This banh mi’s filled with pickled veggies, chicken liver bacon salad, and... then more bacon. The classic Beef N’ Cheddar has braised beef, steak sauce mayo, and crispy onions, along with Goose Island Matilda Bacon. So, if you like bacon and you like beer, congratulations on passing the U.S. Citizenship exam. 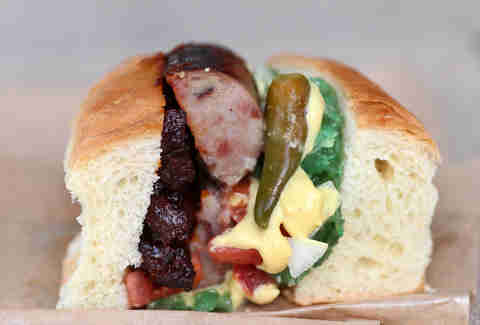 Injecting a Chicago favorite with even more pork, the River North Bacon Dog places a red hot made with bacon & jalapeno-bacon jam in the mix of traditional Chicago-style accoutrements. 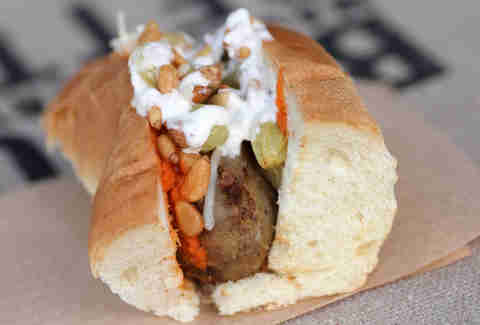 Even the vegetarian sandwich, a smoked eggplant meatball parmesan, is available with bacon for just $1 more. And money spent aggravating vegetarians is money well-spent, indeed. 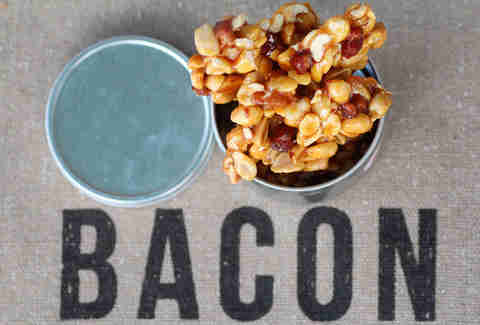 For dessert, help yourself to some bacon peanut brittle, with caramelized sugar coating crunchy peanuts and chunks of bacon. 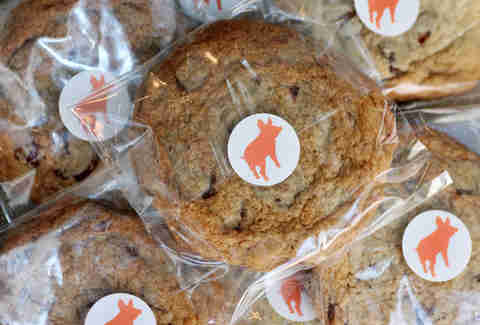 And, just when you thought you’ve been brought to the point of bacon hysteria, there comes the bacon chocolate chip cookies baked with not butter, but... bacon fat. For those playing at home, the word “bacon” has appeared 25 times in this article. Bacon! Make it 26.